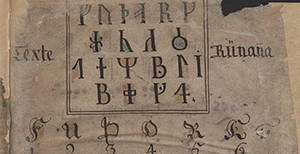 The RuneS-project, „Runic writing in the Germanic languages“, is funded by the Union of the German Academies of Sciences and based at the Academy of Sciences in Göttingen. The research programme is conducted at three research units: in Kiel, Eichstätt-Munich, and Göttingen. It is the aim of the project to describe and analyse runic writing in a comprehensive way, transcending the boundaries of the three groups of runic writing systems (older fuþark, Anglo-Frisian fuþorc, younger fuþąrk/fuþork), ensuring a context-sensitive theoretical approach (period under investigation: ca. 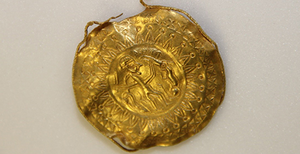 AD 100-1500). The project explicitly regards the runic script as a system evolved in various ways over the centuries, fulfilling various communicative functions within the different historical societies it was used in. The centrepiece of the project is the RuneS database. Accompanying the research, the relevant runological and linguistic data are collected digitally, systematically processed and classified, and then analysed with a view to the different research questions. 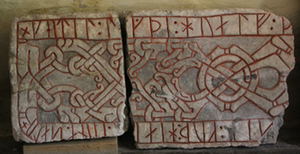 RuneS 1.0 constitutes the first version of this online database. It contains the comprehensive basic data on the nature, content and context of the European runic finds, covering data on runic inscriptions on everyday objects of different types and on runic entries in Mediaeval manuscripts, the Runica Manuscripta. 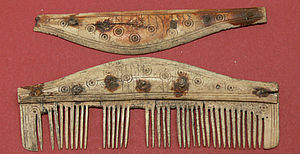 It is the aim of the second research section, Runic text grammar and pragmatics, to determine the formal features and communicative functions, and to delineate the changes in the use of the runic script from the perspective of social and cultural history: What kinds of utterances were written down? It is our aim to develop a system that will allow for the description of the inscriptions as text types. This means that the complete runic monument – the inscription-bearing object itself, the text written on it, accompanying iconographic elements and ornaments, the order of all these signs on the sign-bearing object as well as the historical circumstances of the find itself – need to be viewed in a synopsis, providing a basis for determining the function of each individual written document in the society it was produced in. In this way, a history of runic writing will emerge that presents a clear picture of the function of this script within the different cultures it was employed in. The data stored so far ranges from information on the historic findspot and the present location/place of storage of the runic find, contextual information on the written object, its material and state of preservation, on the historic find context and the dating of the object, to a transliteration of the runic inscription/the runic entry, a German and English translation as well as the identification of the rune row and a general classification of the category of the inscription/the entry. Our information is derived from different sources (to the list of sources). The compilation of the data and the description according to classification systems developed specifically for this purpose are the first results of the project (to the terms and principles of standardisation). These data are illustrated with the help of flexible maps and – wherever possible – by photographs and illustrations of the runic finds. The design of the data presentation is bilingual, all relevant context data of the runic finds are available in a German and an English version. The website has been designed in such a way that it is possible for newcomers to gain a first overview via the find list and become familiar with the range and diversity of runic literacy and its extension within Europe. In addition, a separate search box allows for rapid access to individual finds via the most commonly used names and the shelf marks of the runic finds (to the list of shelf marks). Default queries are provided to give the user a first impression of the different types of runic finds. They provide ready-made search queries on the basis of the main characteristics of the runic finds, such as the type of inscribed object or the attribution to a rune row. The more practically oriented query regarding the present place of location/storage may be used as a starting-point for planning a journey to the original finds and their findspots. More flexible and individually combinable data filters may be found under the headings find map and extended queries. The result of the query is presented in the form of a table or of a map of results, accompanied by a timeline showing the distribution in time of the selected group of runic finds. RuneS 1.0 and the data presented here are continuously updated and checked. We place great emphasis on the scientificness and correctness of the data. Please inform us about any errors you may find via the button in the top righthand corner of each page. In the course of the current investigations on Runic Graphemics the website will be enlarged in the next few years (from 2018/19 on) by data on the individual runic signs (graph-type variants and graphtypes) and on their changing linguistic functions (RuneS 2.0). Various search functions as well as temporal and local distribution maps will be available for this section as well. The flexible combinability with the basic data of RuneS 1.0 will make it possible to answer context-dependent research questions on runic graphemics. In the framework of the text-grammatical description and pragmatic classification of the runic texts data on form and function of runic writing will also be included (RuneS 3.0).